Over the past ten years, J.J. Abrams has slowly become the Gordon Ramsay of big-budget filmmaking. He comes in, figures out how a franchise has been mismanaged, then sets about trying to set everything right. Abrams probably swears less than Ramsay, but his ability to identify with surgical precision what the bleeping problem is has been proven time and again. Starting with Mission: Impossible III, his feature directing debut, and then the Star Trek reboot, he and his collaborators Alex Kurtzman and Roberto Orci demonstrated an intuitive sense of what elements of a film can be drawn out, blown up until they're fit to burst, then deployed in such a way that they can draw as big an audience as possible. Whether it was coming up with increasingly more inventive ways for Tom Cruise to almost kill himself or reducing the crew of the Enterprise to a handful of simple characteristics, Abrams and his team were able to resurrect dormant properties by taking familiar characters and situations, twisting or subverting them slightly, and delivering them with furious energy. Now Abrams, sans Kurtzman and Orci, turns his hand to Star Wars - although its arguable that he already had a dry run at it with his Trek films, which owed more to George Lucas than Gene Roddenberry - with The Force Awakens, the seventh entry in the series (excluding incalculable spinoffs), the first to be made by Disney, and the first to be made without the direct involvement of its creator. In tackling one of the most popular and agonized over mythologies in modern culture, Abrams and his co-writer Lawrence Kasdan, working from a story by Michael Arndt, manage to be both bold and conservative, with the balance between the two shifting in favour of the latter the further we get from the opening crawl and the closer we get to the "directed by" credit. For its first thirty minutes or so, The Force Awakens is about as good as any Star Wars movie has ever been. After the opening exposition establishes that Luke Skywalker (Mark Hamill) has gone missing and that he is needed to defeat the First Order, a kind of hip startup version of the original trilogy's Galactic Empire, the film barrels forward with furious speed and tremendous confidence. Rather than take the easier path and start with familiar faces, the story sets to work introducing some new ones, albeit in situations that feel pretty familiar. First: Poe Dameron (Oscar Isaac), the Resistance's best fighter pilot, who arrives on the desert planet of Jakku in pursuit of information on Luke's whereabouts. When his mission is interrupted by murderous First Order goons, led by the series' new masked Sith Lord Kylo Ren (Adam Driver), Poe places the information in the hands - or at least the compartments - of his adorable droid BB-8, who sets off into the night hoping that Poe will come back for him and his precious cargo. During that same raid, we meet Finn (John Boyega), a Stormtrooper who, when faced with the task of brutally killing civilians, flinches. All too aware of what will happen now that he has been outed as a nonconformist - the First Order don't seem like an organization that offers compassionate leave - Finn offers to help Poe and winds up on his own (grudgingly) heroic journey. That journey causes him to cross paths with Rey (Daisy Ridley), a staff-wielding scavenger/autodidact who ekes out a beyond meager existence on Jakku, and who meets both Finn and BB-8 at an inopportune moment. As ever with Star Wars, inopportune moments involve a lot of blaster fire and a last-ditch escape in a (preferably battered and dented) spaceship. Unceremoniously thrown together, they take their first steps into a larger franchise. That first act, with its breathless pulp storytelling and sense that every moment is driven by an impatient desire to just get to the next one already, is some of the most exhilarating pop storytelling I've seen since, well, Star Trek. Abrams tears through the plot like an eager child reading a comic book, desperate to see what awaits him on the next page. Yet the film doesn't feel rushed. Even as it runs at top speed, it establishes the new characters with moments that are both broad and specific. Finn and Poe escape from The First Order by stealing a ship and making a daring escape, but they're also engaging in a dialogue that cleverly reveals things about them. Poe is devil-may-care and self-assured in any situation; Finn is a capable fighter who runs from violence. Later introductory scenes establish that Rey is a survivor who dreams of better things and that BB-8 is loyal, versatile, and liberal with both electric shocks and thumbs up. The characters are drawn in broad strokes, but they at least have personality and the actors do a lot to make them feel specific and lived-in, qualities that were, along with a sense of humour, missing from the prequels and which The Force Awakens delivers by the bucketload. The return of practical effects also do much to lend a sense of reality to proceedings. Not merely because, in the modern blockbuster landscape, there is something nostalgic about seeing real people doing physical things in actual locations, but also because there is a greater possibility of getting a decent performance out of an actor if they can see what they are working with, rather than waving a ball in front of them and hoping that everything will turn out all right in post. That physicality also manifests itself in the film's lightsaber battles, which abandon the elaborate choreography of the prequels and hew much closer to the style seen in The Empire Strikes Back and Return of the Jedi. Which is to say that the combatants whale on each other and seem to have a really hard time of it, rather than making it seem like being a Jedi involves training with Busby Berkeley. There's also a return to the idea that lightsabers serve as totems for their users. Kylo Ren's, with its much-discussed laser crossguard, has a raggedy beam and looks volatile, an aspect shared by its user, who violently lashes out whenever something doesn't go his way. Again, this is a very simple choice, but it's one that works in a story operating on the level of myths and fairytales. It suggests that a lot of thought went into why things on-screen are the way they are, rather than merely how to make them look cool (though looking cool is a plus). Somewhat ironically, The Force Awakens feels most like a Star Wars film - and specifically the original Star Wars, a.k.a A New Hope - the less it has to do with the established Star Wars universe. Part of the thrill of the original films was seeing something that felt both new and old at once. New because it showed us things we'd never seen before, old because the universe itself looked like it had genuinely existed for thousands of years (and because it deliberately hearkened back to antiquated, even ancient modes of storytelling). The Force Awakens has that feel to it, initially, because even as it retreads the plot beats of Star Wars, it does so with new characters (albeit ones which conform to familiar archetypes) and renewed energy. Once the old cast start showing up, a lot of that vigour starts to fade as the new story has to make way for the moment when, for example, Han and Chewie return to the Millennium Falcon. Now, these moments are fun in and of themselves. There is a unique thrill to seeing Harrison Ford in a Star Wars movie again, weathered but still roguish and completely out of his depth. The pangs of joy and excitement are undeniable, and even if they sometimes edge into the realm of fan service, it's hard for me, as a fan, to complain that much about them. And Abrams and Kasdan do find ways to make those returns feel significant. Han Solo doesn't just come back because he is an iconic character and they have to include him; he serves a purpose within this particular story and within the broader story of this ongoing saga. However, they do break the flow of the film, and every time that I got taken out of the film, I started thinking about how so many of the pieces were just repurposed moments from earlier movies. 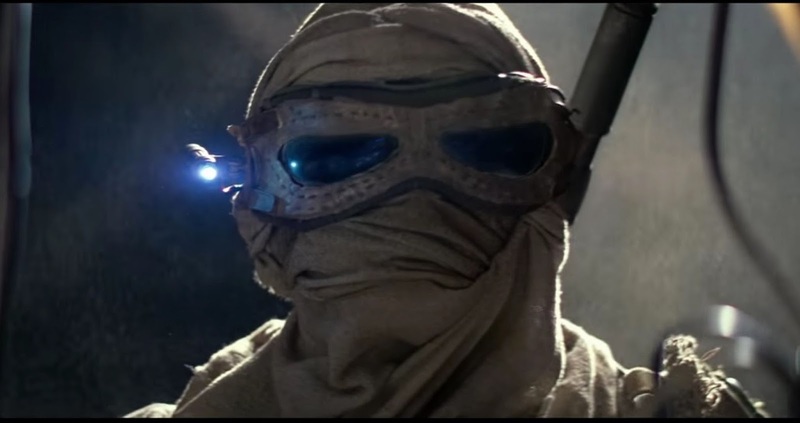 Other nods or allusions, such as a bar reminiscent of the Mos Eisley Cantina (with new music by Abrams and Hamilton star/creator Lin-Manuel Miranda) are integrated less ably. They stick out like a sore thumb, as does the inclusion of minor characters and cameos by assorted notables. If having 30 Rock's Judah Friedlander play an extra in one shot serves any purpose, other than to distract from the fiction of the movie, it is to underline the idea that Star Wars has now passed from being the (singular, idiosyncratic, frequently terrible) work of one man to one owned (both figuratively and literally) by the people who grew up watching it. If there's a single image in The Force Awakens that sums up Abrams' approach, it comes early on. Rey returns to her home after a day of foraging for debris and scrap in the remains of a downed Star Destroyer, eats a rudimentary meal, and makes a mark on the wall to indicate that another in a long series of days has passed. As she contemplates her situation, Abrams cuts to an exterior shot to show that Rey lives in the wreckage of an AT-AT. Like Rey, Abrams is working within something created by George Lucas, and the most he's prepared to do with a series that dwarfs him is to make his mark on it, even if that mark is relatively small. To that end, Abrams fulfills his role of renovating and revitalizing Star Wars for a new age and a new stage in its existence as a series. The Force Awakens leans too heavily on old ideas and familiar tropes, but it's also full of spectacle and wonder and joy. When Finn shouts, during one of a series of cascading escapes, "Are we really doing this?!" it's hard not to imagine everyone involved is thinking the very same thing. "Are we really making our own Star Wars movie?!" That enthusiasm, coupled with great performances, carries the film through its dips and makes its highs all the sharper. It leaves threads dangling for future installments - what franchise film doesn't these days? - but it also provides a new sandbox for other, hopefully more adventurous filmmakers to play in. As Abrams vacates the director's chair for Rian Johnson, who takes over for Episode VIII, he leaves him with a great set of new characters, an intriguing conflict, and a truly huge canvas. Whether those things will be put to good use remains to be seen, but there is hope in Star Wars for the first time in a long, long time.